Infrastructure in general refers to a set of interconnected structural elements which provide services and facilities necessary for the development of a society or nation state. National Infrastructure is defined as ‘critical’ when it is believed that, disrupting its function would lead to significant socio-economic crisis with the potential to undermine the stability of a nation and thereby have political, economic and strategic implications. These infrastructure assets may be physical (sites, installations, pieces of equipment) or logical (information networks and systems). Many of the critical infrastructure components are completely dependent on communication systems to perform their missions. Even after six decades of Independence, India is still not able to manufacture a single mobile device or even our own Operating System (OS). According to Global Innovation Index 2015, India stands at staggering 66th rank where as Switzerland; just the size of an Indian state tops the list. Ironically India alone produces engineering graduates (per year) close to the entire population of Switzerland. Yet, instead of contributing for the establishment of indigenous mobile manufacturing units many of the scientific gurus and political pundits say that manufacturing the devices on our own is ‘time consuming’ and at the same time inviting foreign companies to manufacture in India and exploit its resources and huge population base. At what cost are we inviting them to exploit our resources will be explained in the rest of this article. The communications sector provides the foundation for information exchange for all other sectors including voice, data, video and Internet connectivity. As such, telecommunications systems are part and parcel of other key national security and emergency preparedness resources and are an important component of the overall national critical infrastructure. It is therefore paramount to recognize the importance communications has for national security and related policies. At the same time, it is important to recognize the key factors upon which the communications infrastructure is dependent. In particular, the focus of this research is the interdependencies between the communications sector and the national critical infrastructure. As the technological advancements are exponentially rising in communications system engineering there are also new security challenges to be addressed in this field. After Edward Snowden exposed the snooping activities of global communication channels, many of the nations were jolted over their security situation and raised concerns over the USA’s act of massive surveillance. Information is the set of coded data, it can be stored, transported, manipulated and is degradable. In the 3rd century BC, the Library of Alexandria was believed to house the sum of human knowledge. The advent of the World Wide Web and other communication technologies has significantly changed how we access information, the amount of information available and the cost of collecting that information. In the 19th century due to the two great wars i.e. World War I and World War II the field of strategic information warfare has evolved and knowing the adversary’s strategic locations, war planning, deployment of forces, weapons capability etc became the main priority for the ‘strategic information warfare’. Therefore protection of information became very crucial and it became national security priority for most of the western, European countries. A German illustration created during World War II in an attempt to get Indian soldiers to listen to the German propaganda radio. The text says: Whoever listens to the radio always remains connected and up to date. Flow of information takes place in many forms; one of the crucial forms is information broadcasted with transmitter through the medium called carrier and received by the receiver at the other end. Human brains are also carriers of information but they can analyse, process and store it. Throughout history there have been many examples where the adversaries have tried manipulating the human brain to extract strategic information through different means, for example getting the critical information from an employee working in the data-centre at critical organisations of government and using the information as the backdoor and blackmailing purpose is one the psychological warfare conducted in recent years and is called as “Information Warfare”. 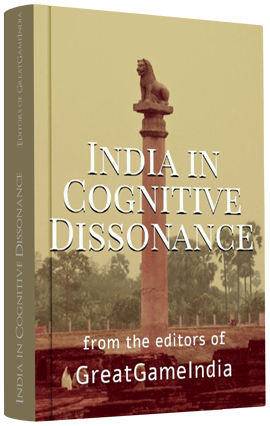 Recently an investigation showed how India’s vital institutions are leaking secrets in realtime to other countries and vested interests. At the end of Operation Sarkar as they informally called it, the hackers had managed to “test-scan penetrate” over three lakh routers in the heart of the capital and expose India’s best-kept secret: that 95 per cent of them, in such critical departments as defence, finance, space and communications, were leaking and being exploited by rogue entities based in China, Ukraine, Malaysia and elsewhere. Click here to know the key establishments in New Delhi whose leaky routers hackers have plugged into-and the location of the rouge servers. The advent of information-theoretic models for Information Warfare establishes this as an area of study within the information sciences, in addition to its interest for the social sciences, military science and information systems. Information Warfare is defined as “An electronic conflict in which information is a strategic asset worthy of conquest or destruction”, a definition covering only offensive actions. The overall goals of Information Warfare attacks are identified as the theft of information, modification of information, destruction of information and destruction of the information infrastructure, with the ultimate goals of acquiring money and power and generating fear. Perhaps the most widely accepted formal definition of Information Warfare is the model asserted by the United States Department of Defence which defines it as ‘an action to Deny, Exploit, Corrupt or Destroy the enemy’s information and its functions; protecting ourselves against those actions and exploiting our own military information functions’. There is an emerging element of information warfare, one that appears to be common to almost all currently evolving uses of this term and that warrants identification and definition – where nations use communication infrastructure to affect strategic military operations and inflict damage on national information infrastructures. As portrayed in Figure 1, the strategic information warfare is essence of the intersection of evolving information warfare and post Cold War “Strategic Warfare” concepts which warrants special recognition and attention to the new facet of warfare. The strategic information is the key element of the communication system and securing it is the biggest challenge. During world wars the mechanism of passing the information from one place to other in short time created a need to induct the information into the electromechanical systems. Since then information revolution has created huge change in the electro-mechanics field and created the branch communication systems or Telecommunications. The United Kingdom and United States of America Agreement (UKUSA) is a multilateral agreement for cooperation in signals intelligence between the United Kingdom and the United States. It emerged from an informal agreement related to the 1941 Atlantic Charter; this secret treaty was renewed with the passage of the 1943 BRUSA Agreement. In the following years, it was extended to encompass Canada, Australia and New Zealand. 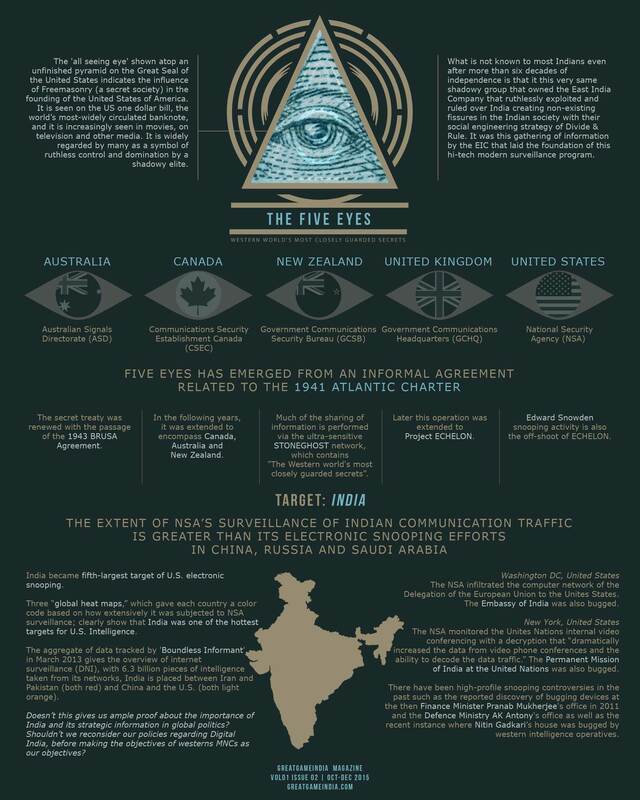 This alliance of intelligence cooperation is also known as Five Eyes. Other countries, known as “third parties”, such as Germany, the Philippines and several Scandinavian countries also joined the UKUSA community. Much of the sharing of information is performed via the ultra-sensitive STONEGHOST network, which contains “the western world’s most closely guarded secrets”. Besides laying down rules for intelligence sharing; the agreement formalized and cemented the “Special Relationship” between UK and the USA. Due to its status as a secret treaty, its existence was not known even to the Prime Minister of Australia until 1973, and it was not disclosed to the public only in 2005. On 25 June 2010, for the first time in history, the full text of the agreement was publicly released by Britain and the USA. By the end of the cold war this operation was extended to project ECHELON. It is originally a code name, and now used in global media and in popular culture to describe signals intelligence (SIGINT) collection and analysis network. Recently leaked documents by Edward Snowden showed the intelligence sharing activities between the First World allies of the Cold War are rapidly shifting into the digital realm of the World Wide Web. After the information explosion of snooping and surveillance activities the United States of America went through its own security self assessment. The resulting reports of security analyses of the US communication infrastructure and security systems jolted the entire White House. The National Security Agency of the USA itself was under surveillance by two tech-giants of Israel. In the above case study we glanced at how USA found itself under surveillance attack by the Israeli companies and how by learning from their mistakes took steps to strengthen their security laws thereby reviewing those company contracts after the incident. Ironically, these same Israeli companies under investigations by the US agencies are being welcomed with open arms by the Indian government. The Indian government is planning to grant the communication infrastructure installations contract to these same companies under Digital India Smart Cities program. The same Israeli surveillance firm Verint Systems is set to get a contract from the Indian Department of Telecommunications for mass surveillance to facilitate government interception of encrypted electronic communications.